The show stealers in this rosary are the 6mm Czech fire polished AB Emerald Avé beads. These beads are emerald in color, but the Aurora Borealis coating on them is so intense that they reflect beautiful shades of blue, light green and sometimes even pink. The Pater beads have a Celtic knot design and contrast the Avé beads very nicely. The crucifix is a Celtic cross which has long been an Irish symbol of eternity. The front side of the center honors St Patrick who is one of the patron saints of Ireland. The reverse side of the center honor St Brigid who is the other patron saint of Ireland. Both the crucifix and the center are silver colored metal. The wire is German silver which is also known as lead free nickel silver. 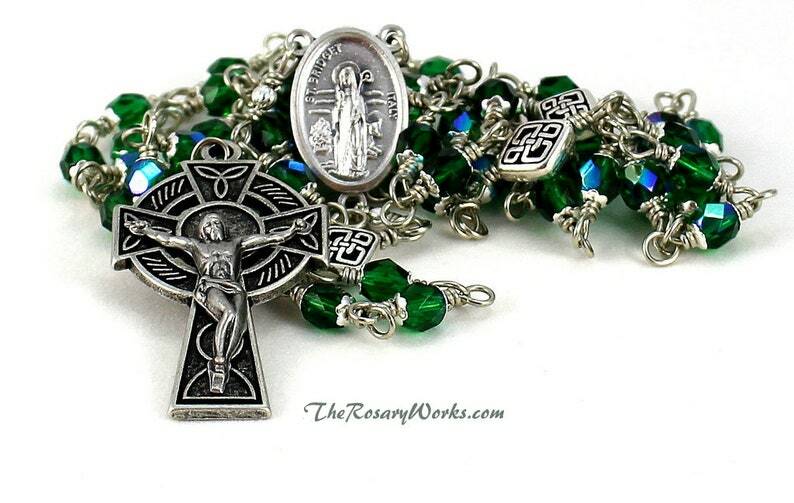 This rosary would make a wonderful gift or would be great to keep for yourself. 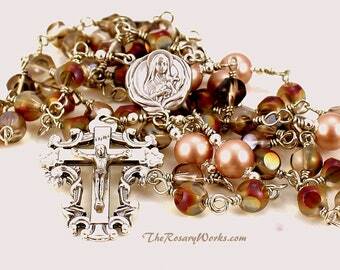 This rosary is brand new and is handcrafted. UNBREAKABLE ROSARIES Dainty and durable are adjectives that are seldom used to describe the same thing. However, this unbreakable rosary is both dainty and durable. The German silver wire is coiled 2 1/2 times at either end of each bead. Because of this, it is impossible to break this rosary with normal wear and prayer. GUARANTEE: I am so confident in this construction that I will fix it for free if it should break with normal wear and prayer. However, care should be taken with this rosary and all my prayer beads because it is possible to chip or break the beads.